Best wishes on your quest to locate that perfect German Shepherd Dog (GSD) to enjoy! The contributors to this brochure are each involved in one of a variety of activities with GSDs. All are committed companions to one or several GSDs and came together for this project through a computer electronic mail list devoted to education and enjoyment of the breed. We are delighted to help you in your search. We all remember our first Shepherd shopping adventures and hope yours will be informed, fun, and that we can help you find that special friend. Is a German Shepherd Dog Right for Me? Before getting a dog, it's best to evaluate your life and your family's life. Are your hours at home irregular due to work or your social life? Do you mind having to go home after work, or staying home a lot on weekends to care for and be with your dog, even if it means curtailing some social activities? Do you plan on traveling a lot in the near future? Is your time already precious to you because you have children to concentrate on and must constantly drive to lessons/practices/games? 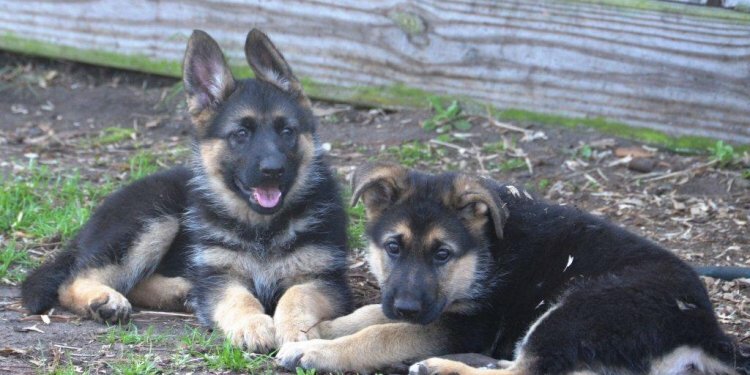 Is everybody in your family excited about getting a German Shepherd Dog, or would some rather have another breed? If you answer yes to any of these questions, please reconsider getting a German Shepherd Dog now. Wait until your circumstances change. You'll be glad you did, and so will any dog that you acquire. You should consider the following recommendations as your basic commitment to your new GSD. Take at least an 8 week obedience course to assure that you are the dog's leader. Be prepared to socialize your dog by exposing it to as many people and situations as possible to develop its confidence. Vigorously exercise the adult GSD at least 20 minutes daily. Brush the coat daily. Trim nails every other week, clean ears, and brush teeth weekly. Vacuum often during shedding seasons. If a change of residence is required, make sure that your GSD is welcome at the new address. Realize that a GSD is a very social animal and should not be left alone for long periods of time. Before a problem gets out of hand be willing to call a trainer, a behaviorist, or a member of the local rescue group for help. You Look Forward to a GSD, Now What? Pet stores and pet owners who have litters of puppies-yes, even with "papers" -often don't commit the long term health screening, early and critical socializing time, initial immunizations, and good food resources that are necessary to get your puppy off to the best start and prevent later problems. Some of this lack of what many responsible breeders and GSD owners feel is vital is due to greed and profit considerations, but it is just as often due to ignorance. A responsible breeder follows a strict breeding program with the goal being the betterment of the breed rather than a quick profit from a litter of puppies. People who have been breeding and studying the GSD are aware of the importance of not breeding until the sire and dam are 2 years of age, of several generations in the pedigree (family tree) having certified (OFA) sound hips and elbows, testing for uncommon, but certainly not rare blood disorders and eye problems that have emerged in GSDs, and not breeding shy or overly protective dogs. All of these traits or health problems can be passed on to the puppies, causing huge vet bills and inestimable heartache. A responsible breeder or rescue group will be available to you for questions for the life of your dog, in most cases.